Last week with the kids and hubby home, I didn't get out for any thrifting, but I still haven't shown you any pictures of my finds from the week before. I made a trip to Monticello which usually means that I have to stop at every thrift store between my house and Monticello. I made the mistake of putting some things away without taking pictures so I'm sure there is more that I'm not showing, but here are some of the items I was lucky enough to find. I found this cute little doll stroller at the Deseret shop. It was a steal and I don't even care that it's missing its hood. I think I'll add a little floral decal to the sides. I was thrilled to find this lovely mirror. It has great detail with bow at the top and all the little scrolly stuff. 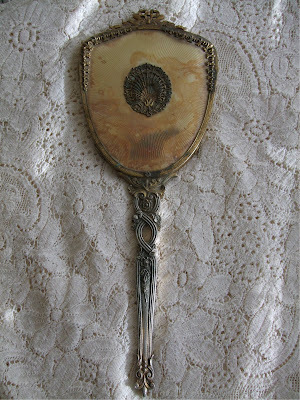 Even though it is quite stained under the plastic thingy, the mirror part is in good shape. If I took the plastic part off, that little medallion would have to go to as it is sitting on top. What do you think, leave as is or try to fix it? That same day I found not one, not two, but three chenille spreads. Actually the top and bottom are authentic vintage chenille spreads, the middle one is a queen sized duvet cover (newer). I can never say no to a chenille spread if the price is right. Actually, that's not true. I am a little bit of a chenille snob. They have to be a nice color and they absolutely have to be 100% cotton. In my early days of collecting chenille spreads, I bought a couple that were a blend (with polyester) and they were awful. See, I'm a chenille snob. Once I got to Monticello and did a little rearranging, I had to do a little looking around. I bought this adorable tole painted trash can from this fabulous dealer. Debbie has great taste and style. I always love the items she chooses and she is a master at display. 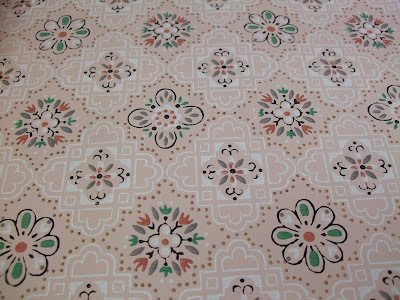 I also got this roll of vintage wallpaper and some vintage ticking from my good buddy Sue's booth. Another dealer had this adorable couple planter. I have seen these a lot and always wanted one, but I just had to have this one as I love the colors on it and the price was right. The day I was suppose to work on soldered charms with Joy, I stopped at thrift store I don't normally go to and found this adorable vintage glass hobnail lamp and these cute vintage hangers. 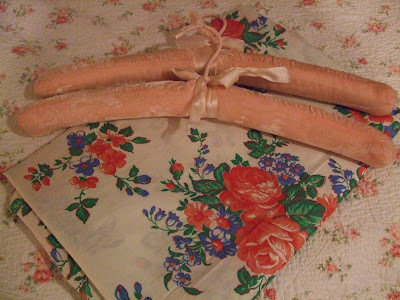 And finally, I found these two fluffy pink velvet hangers and a large piece of vintage rose fabric at the Trading Post Antique Mall in Sherwood. 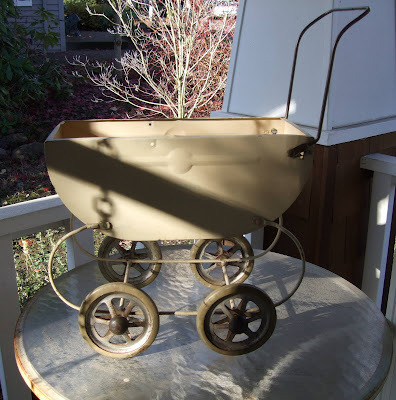 On my next post I will share with you the day I had yesterday out with my sweet daughter, more vintage finds and I also have another giveaway planned, so come on back! We both have a hobnail lamp without a shade...lead the way now...what do we do? 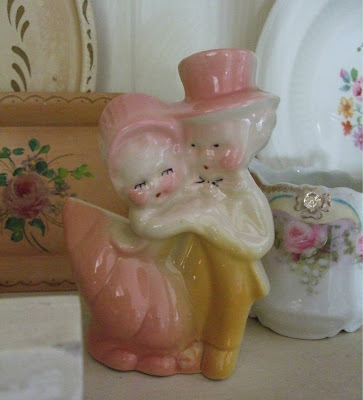 I see a rhinestone on a rosey creamer or something by the couple planter...tell me about it? There is no way I would get rid of that medallion! Maybe you could adhere fabric or something around the medallion to cover the stained plastic if you don't like that part. 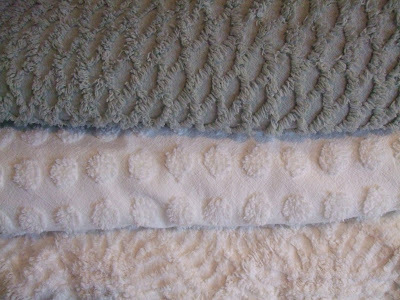 Love the chenille spreads! I too am a sucker for them. I have a whole closet full of them that I keep saying I need to do something with. That's some successful thrifting! Love that lamp, seems like it would work with a variety of shades. Time for another of my blog banner give-a-ways..If you are interested please leave a comment on my blog. Goodness; you have found so really lovely pretties. Love the trash basket. Fab finds! The hobnail lamp and the white polka dot chenille are just swell. As you can see, I have a dot problem. But in a good way. I am having a fun giveaway on my blog if you want to check it out. Send me your home address and I will send off the box of pink rose stationery. Bye for now! Hi Lisa! What beautiful finds! I have no suggestions for the mirror- just love the way it is! You sure found some great stuff! 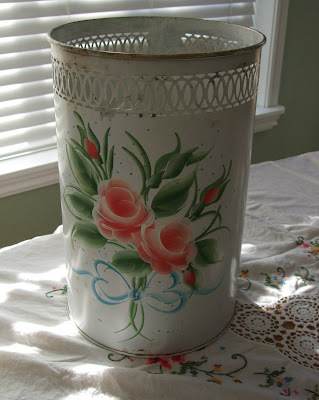 I love the waste can - I have one like it in black - but white and the other colors are definitely prettier! 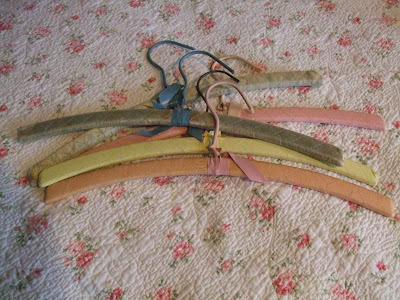 And I love your little couple planter, and the vintage coat hangers. Man, I love shopping at antique malls. And I even made it to Monticello for the first time when I was in Portland last year, so I can picture it. Thanks for sharing your finds - I think my favorite posts by fellow bloggers are the ones where you show us your fabulous purchases! Cute, cute, cute! I just sold an aqua trash can, just like yours, and now am having seller's remorse. Debbie has cute things, huh? Lisa, can I use the photo of Amy Kozma from your blog? I would like to do a post about her. Just let me know. Oh, my goodness! What a difference between your thrift stores and mine! The ones here only have $2 items that were $1 last year at the Dollar Tree. I'm offering a challenge to my blogging friends (if no one has beat me to it) to post pictures of a Christmas decorations on your blog. See the details on my blog. Everyone's invited.